Figs B3.10, 12, 14, 42; C6.1–9. Species recognition. 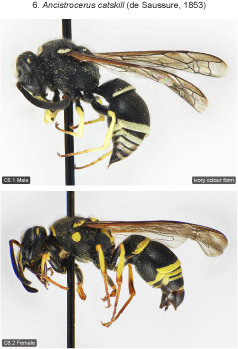 This species is similar to Ancistrocerus sp. 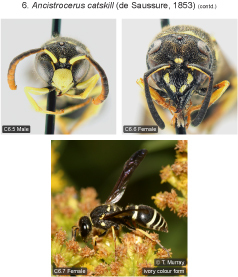 A and A. lutonidus (diagnostic characters discussed under the latter two species). 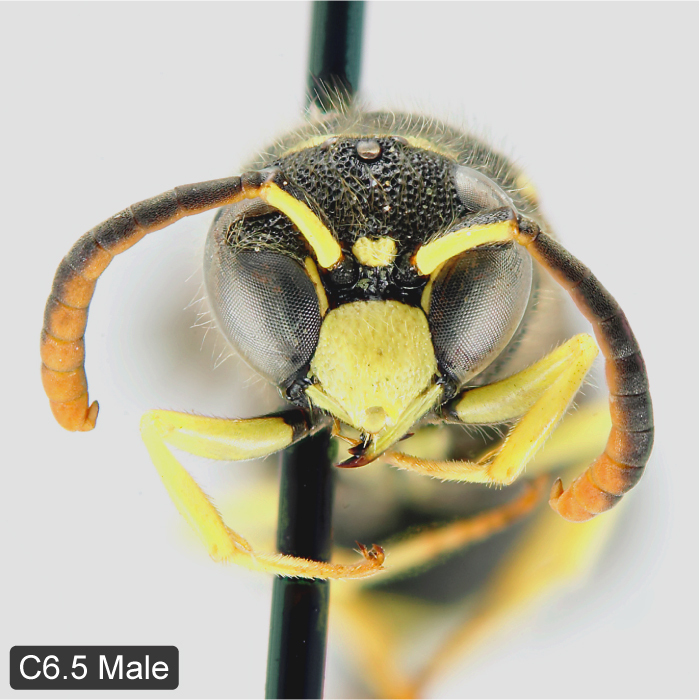 The male of A. catskill resembles A. adiabatus in having the flagellum extensively yellow beneath but differs from that species by the stockier build (i.e., mesosoma less elongate). Variation. Fore wing length 5.5–7.5 mm (♂♂), 7.5–10.0 mm (♀♀). Pale markings of body bright yellow to ivory. In pale forms head markings, especially clypeus, usually more yellowish than metasomal markings. 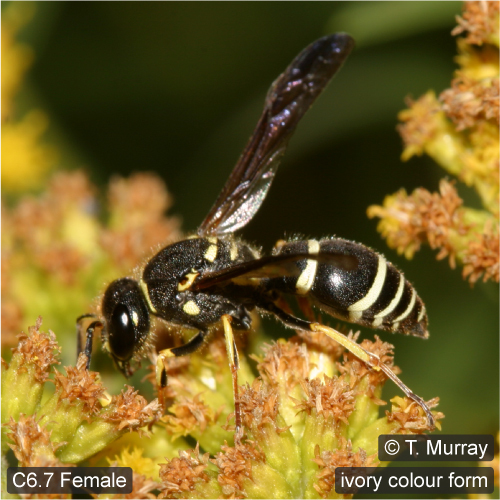 The ivory colour form occurs mostly in northern localities; in Ontario it is usually found from about 45°N latitude northward. 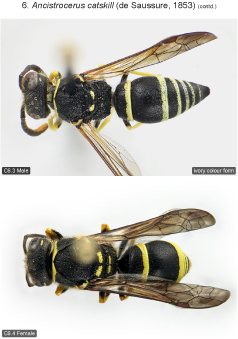 Female clypeus usually with a pair of dorsal and a pair of ventral spots (very rarely ventral or dorsal ones absent); spots often coalescent laterally or ventrally, rarely both laterally and ventrally. 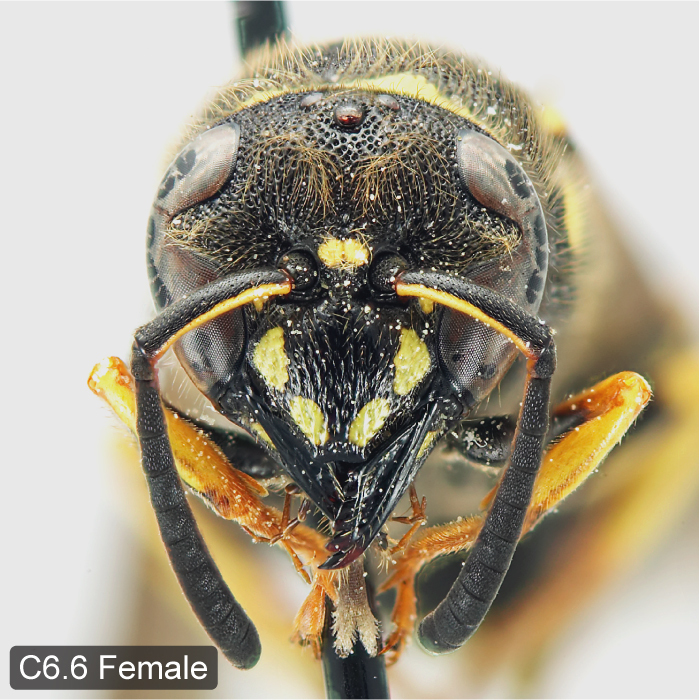 Pale spot of mandible rarely absent in female. Yellow spot along inner orbit of male sometimes interrupted opposite antenna or reduced to a small spot just above clypeus. Pronotal band sometimes interrupted laterally, in male rarely lateral portions absent. 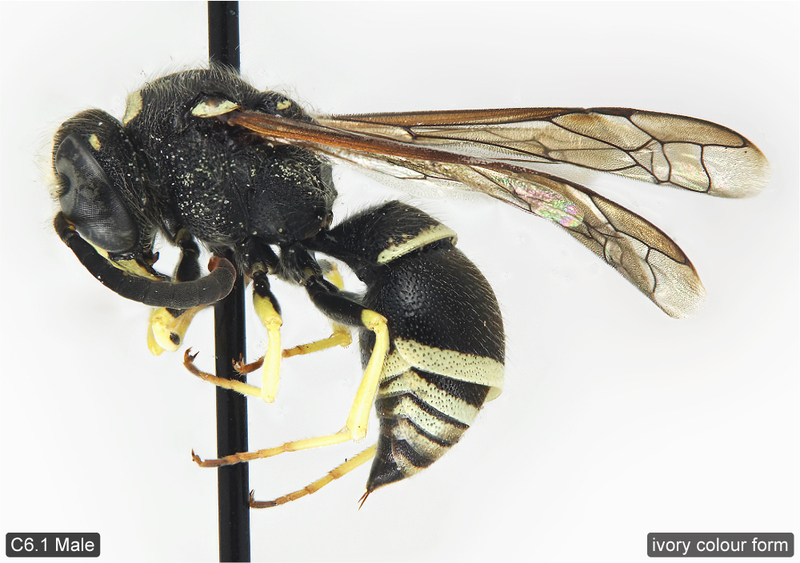 Spot on upper mesopleuron present in female, usually absent or very small in male. Parategula often marked with yellow in female, rarely in male. Pair of pale scutellar spots well developed in female; often small in male, sometimes absent. Metanotal band rarely interrupted medially in female, very rarely reduced to small, irregular evanescent spots; metanotum usually completely black in male, sometimes with small, irregular evanescent spots, rarely with a complete band. 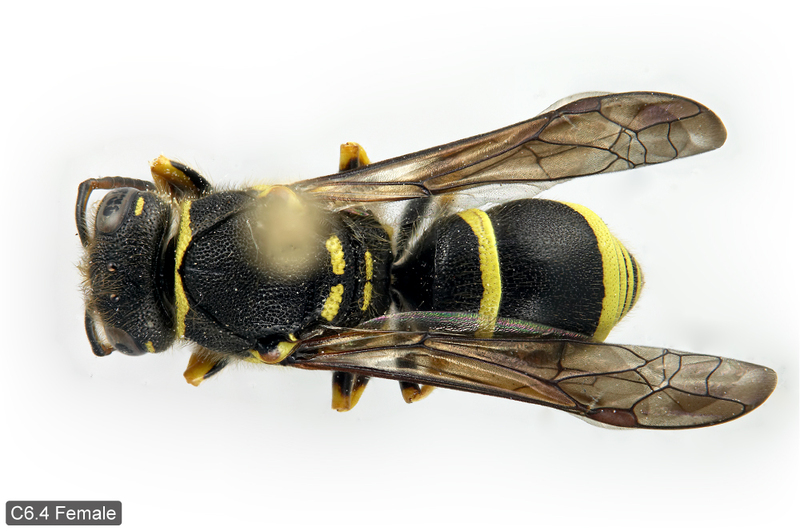 Propodeum in female with a pair of more or less extensive, elongate, pale, lateral spots (sometimes interrupted near pronotal angle); exceptionally absent in yellow colour form (1 ♀, ON, Ottawa area, CNCI); male propodeum black, rarely with minute evanescent spot near pronotal angle. Metasomal terga 1–(4)5 (female) or 1–(4)6 (male) fasciate, tergum 6 of female rarely with a pale spot that is usually small and evanescent. Tergum 2 in female exceptionally with a pair of small discal spots (1 ♀, Quebec: Cap Rouge, CNCI; 1 ♀, New York, AMNH; 1 ♀, North Carolina, CNCI). Female sterna 1 and 2 usually with complete apical fascia; fascia of sternum 1 sometimes obscure or completely absent (especially in ivory colour form), fascia of sternum 2 sometimes reduced to lateral spots; sternum 3 usually with apicolateral spots, sometimes with laterally interrupted fascia, very rarely with complete fascia; sternum 4 usually with apicolateral spots, rarely absent. Male sternum 1 usually with more or less developed apical fascia, sternum 2 always with complete fascia; sternum 3 with complete or, rarely, laterally interrupted fascia; sterna 4 and 5 with or without complete fascia; sternum 6 black or with apicomedial pale spot. Distribution. Canada: all provinces. Transcontinental in U.S. in Transition and Austral Zones (Bequaert 1944a, Krombein 1979). 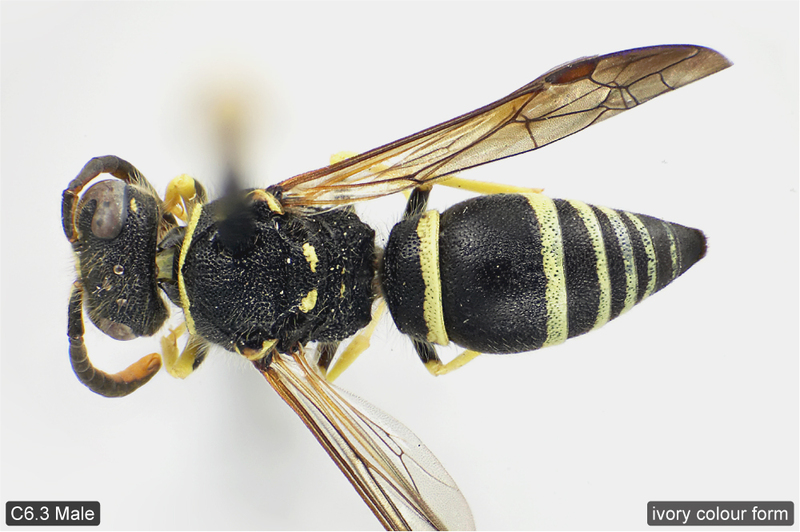 The taxonomic status of populations from British Columbia and the western U.S. requires further investigation. The western ssp. 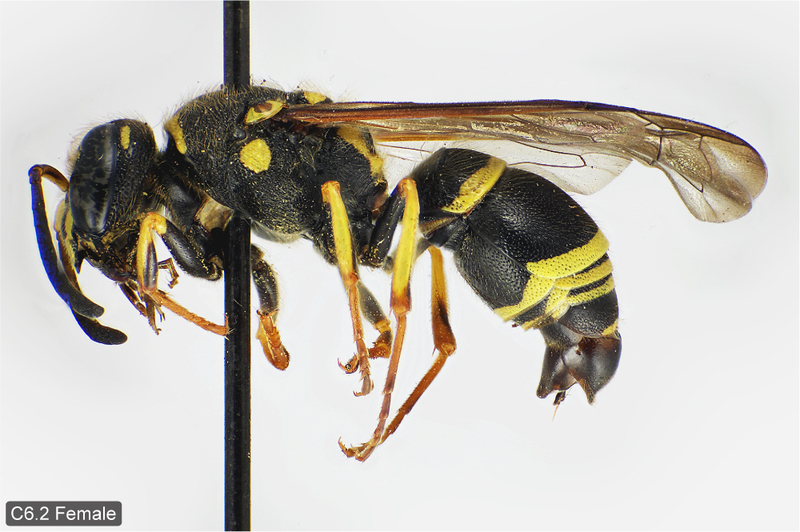 halophila Viereck, 1903 occurs west of the Rocky Mts. The former ssp. albophaleratus is here reinstated as a good species (see above). Biology. 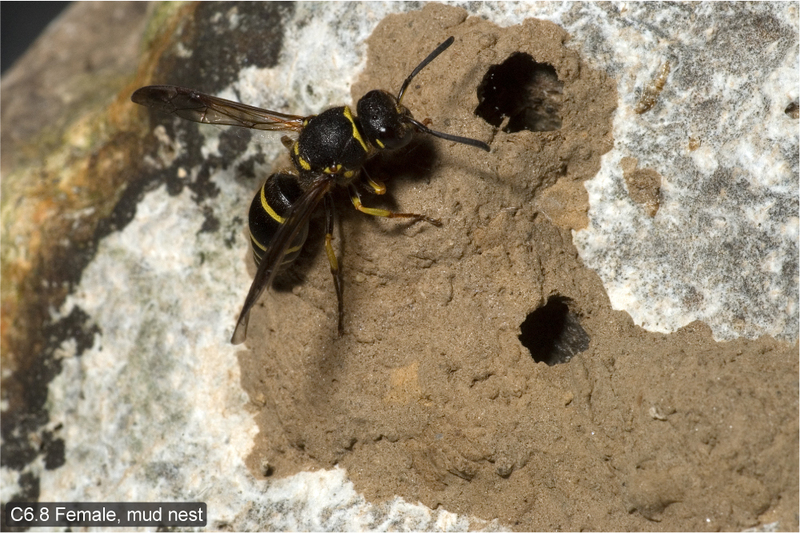 Nests in pre-existing borings in wood and twigs, in abandoned mud-dauber nests and deserted burrows of ground-nesting bees (Krombein 1979). Krombein’s (1967) trap nest data are apparently based on mixture of A. catskill and A. albophaleratus. Due to possible confusion with other species in this complex all previous rearing data have to be treated with caution. 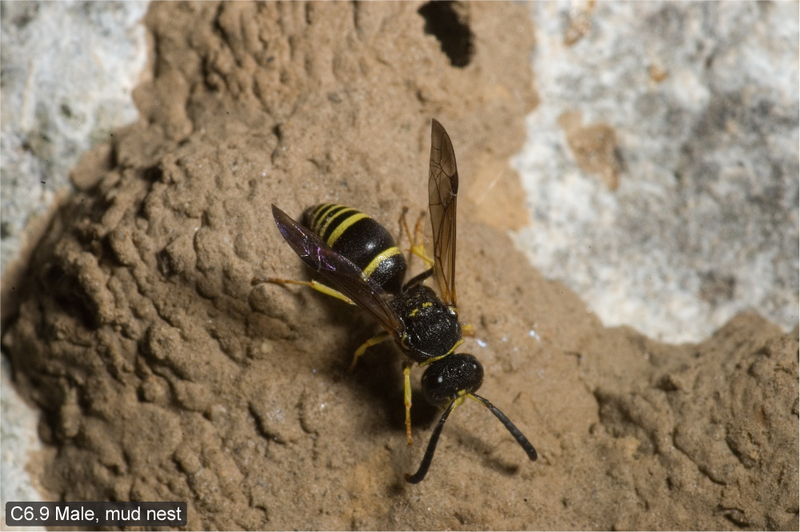 Data from specimens examined confirm that the species nests in cavities: 6 ♀♀ from Guelph, ON (DEBU) reared from trap nests; 1 ♀ from Fairfield, CT (AMNH) is labelled “wasp makes nest holes in hard cement mortar between bricks”. Besides that the species also constructs mud cells that are attached to rocks (1 ♀, “bred from mud cell on stone”; 1 ♂, “from mud cell under stone”; both from W.H. Harrington collection, i.e., likely from the Ottawa area; CNCI). In 2005 we collected a multicellular mud nest on a rock at the edge of a river from which 1 ♂ and 5 ♀♀ emerged (Ontario, Fergus; DEBU) (Figs 6.8–9). The lower cells of this nest were located within a small natural cavity of the rock and were completely hidden by other cells on the surface. The outer cells were fully exposed and thus creating the impression that the whole nest was attached to more or less flat rock surface. Fye’s (1965) prey records apparently pertain to A. antilope (Krombein 1967: 109). Krombein (1967, 1979) mentions Oecophoridae, Pterophoridae, Pyralidae, Tortricidae and Gelechiidae as prey, but his prey records need to be revisited due to confusion with A. albophaleratus.